July is “Beach Portrait” month on Federal Point. No better way to celebrate it than to shout out to our Business Member of the month, John Gregory Photography! For over thirty years, John Gregory has been photographing the southeastern United States. Many of his photographs were published nationally. 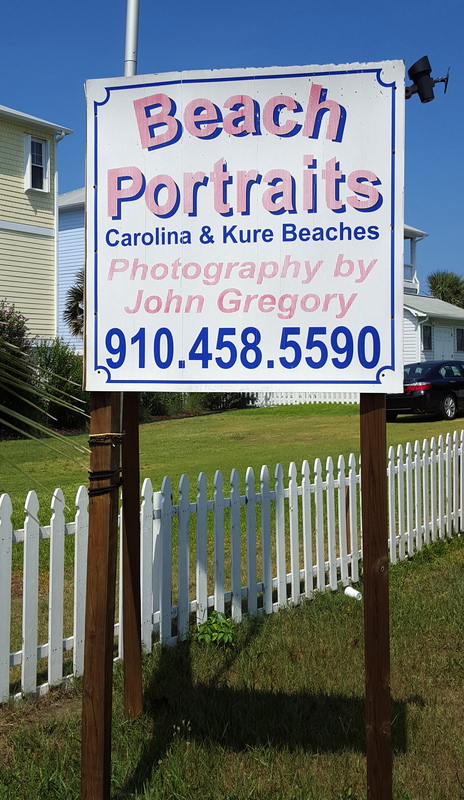 Locally, John Gregory made the 1970 portrait of Big Daddy, which is still being used as their sign in Kure Beach. His photos regularly appear in the Island Gazette, local newspaper. John is also an astronomer. His door has often been open to the public for special celestial events. You may have seen John under the Fort Fisher live oaks or on the sand near the Coquina rock coaxing families to smile just once more. Having seen John Gregory work with families first hand, I can say that no one does it better. With John’s patience and world of experience, no family could be in better hands. Think it is about time to get a professional set of photographs of your family done reasonably and locally? Take a look at his website. The “Portrait Tips” will get you started. It lets you know what times work best, how long it takes, and what to do to prepare. Smart phone photos are great and convenient, but when you decide to frame a photo that you will remember for the rest of your life, let John Gregory take it. You will never regret it. Thank you John Gregory Photography again for supporting the Federal Point History Center as one of our Business Members. We hope our members will return the favor very soon!